I think you cursed me. Now the father got abducted by aliens and came back pregnant, even though there's already 8 sims in the house, plus mom rolled ANOTHER wish to have a baby. She now has two locked in. They both have Fertility Treatments, so I could be looking at 6 more kids. EDIT: Apparently if you don't have room in your household, the baby just goes back to their home world. ...Now I'm disappointed. Awwww what? Is the baby at least in your relationship panel? Like can you call it when it grows up? Long distance calls lol? Nope Doesn't even appear on the family tree. Also didn't fulfill the want to have a baby. 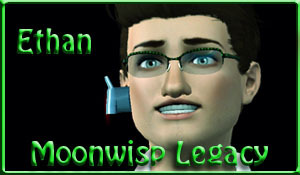 So i started a legacy -- again. Im not officially writing it because honestly i hardly ever get passed the 2nd gen babies turning into adults. I dont know why. But! This time i want it to be different! Ive also changed my normal playstyle which is, click all the things --> 3rd speed repeat. Ive been playing slower. I also didnt make my sims jump into marriage the first day, and have paced things slower. Its much more rewarding. My couple finally had their first child which was a girl named Wynnona. The founders cat had a baby named Piff. Hi Jessika! I hear ya on slowing down! Before I started documenting legacies, I too slowed things WAY down. It was really rewarding for me too! I saw so many little details that I'd missed... Challenges and rules made the game so much fun... It's been great! I have to agree with you, Jessika. My first legacy wore me out because I was micro managing them and I stopped same place as you. To force myself out of the habit, I started an ISBI, so I only micro-manage one of them, and I get to see how fun it is to just let them do their stuff. I'm at a point where even my heir I let him do whatever for his free time. My last post, I mentionned how it was killing me because of the toddler care (he had 5 to take care of practically alone). Well now his kids are all grown up, 7 of them total. If you jump on my blog, I put them through a series of test in a kind of tournament. I'll also need lots of votes to choose who will be heir, so don't be shy. Well, I'm playing my "Selfacy", in Midnight Hollow, but I haven't updated my story for more than 2 weeks... There are things like my boyfriend's stay at my home for a long time, so we we're 24 hours a day together, and also "writer's block" are in the game, of which the latter is still present, and I hope I'll break the ice by writing in this section of the forum. and to get engaged to him. The Sim in question is Julian Poirot. Edit: I also need me some EPs... I think I'll get back to my Sims 4 legacy at least until I get some of them. Welll.... my simself just died by fire so I had to do a lot of cheating to get her back. It was interesting to say the least. Lol. *grabs megaphone* yo is anyone here??? anyway so i'm playing a perfect genetics legacy, still on generation one but the heiress has been born finally! baby #6. hope the others don't take too long! I'm not very far into my legacy so far- my founder is still lawn living, and she's met somebody she likes a lot, but there's complications. Another Sim is bent on causing problems and drama..